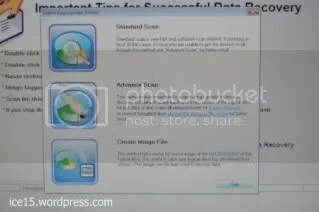 Data recovery software, this is not a software you need everyday but for all those times when you corrupt/format your drive/memory card, this software is very useful. 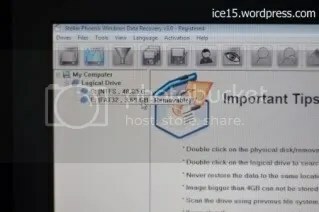 I will not cross the border and say that every household with a computer should have data recovery software, but we all need to salvage lost data every now and then. 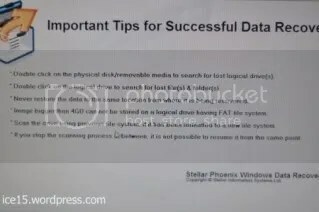 All you need to know about the Stellar Phoenix Windows Data Recovery Software can be found here. This article is all about my personal experience about this software. To install this software, you will be required user privileges. I was able to install it in my Macbook running VMWare Fusion. I had my settings running with only 1gig of RAM and a single processor. Stellar Phoenix ran pretty well in Windows Vista Home Premium. The user interface was simple to use. I used it for the first time without using the help menu. As you place your mouse pointer on top of each button, you will find a text on what that button is for. Here’s some screen shots from my experience. For my review, I tried to recover files from my 4gig SDHC card. The card was formatted using my dSLR, I had 44 pictures in it before I had it formatted. When the program starts, it will give you a “tip for the day”. 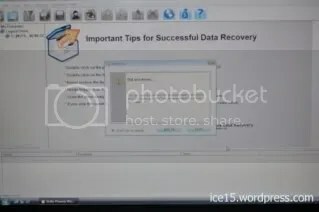 Then it will give you tips for a successful data recovery. The Software did not automatically detect my memory card when I had it plugged in my USB. I had to refresh the available drives. Surprisingly, there is no “refresh button” available. You will have to enter the program’s Drives menu. You will be able to see the drive after refresh. After seeing the drive you want to recover a double click will allow you to choose the available options. I tried the advanced scan and this program did not disappoint! It took almost 2 hours for the program to completely scan my 4 gig drive, I’m not sure if this will be shorter if I had a more powerful machine but for my Macbook’s VMWare setup, I was pretty happy with the performance. 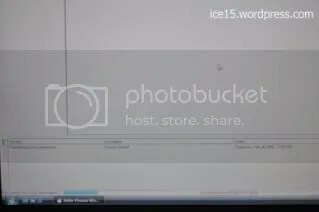 After an hour, you will be able to see subfolders and the files inside it. 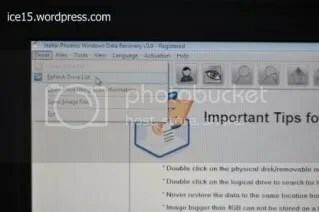 From here, you will be able to view each file and choose which one you want to recover. 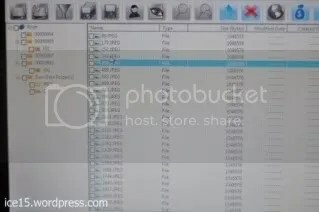 I was only hoping to recover my 44 files before formatting my memory card, I was happy to see a number of files which was long deleted. If you would notice, I first tried to recover a corrupted SD Card. Stellar Phoenix Partition Recovery Software also can recover Hard Disks even if they were partitioned or formatted to another file system. I have limited my review on a regular PC user’s point of view. Honestly, I think that the regular person will only need to recover files from a removable drive or a hard disk. We all know that replacing a spoilt drive is easy, but the files saved inside that drive is priceless. As memory card/drive’s capacity become bigger, the more reason we need to have software like this to at least salvage our data when we fail to back up our drives manually. I’m sure everyone would want to use a user-friendly program during those stressful times when your data is lost. Stellar Phoenix very easy to use and its very gratifying to know that you don’t have to be a geek to recover lost pictures from a vacation, lost data for a report and lost files you use for your personal finances. 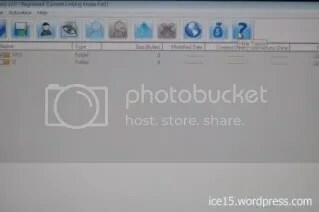 There are some files which are too private. It always helps if you can recover your lost data with the privacy of your own home.